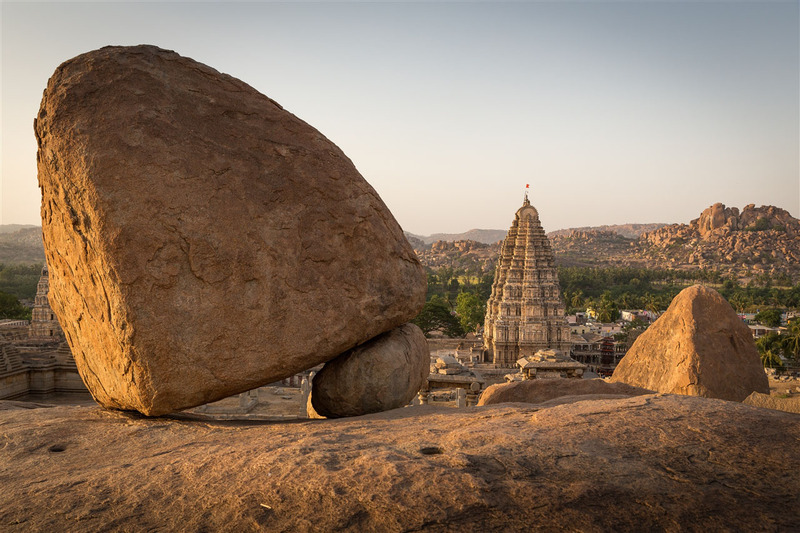 Immediately to the north of the Virupaksha Temple is an enormous rock face with steps cut into it, known as Hemakuta Hill. 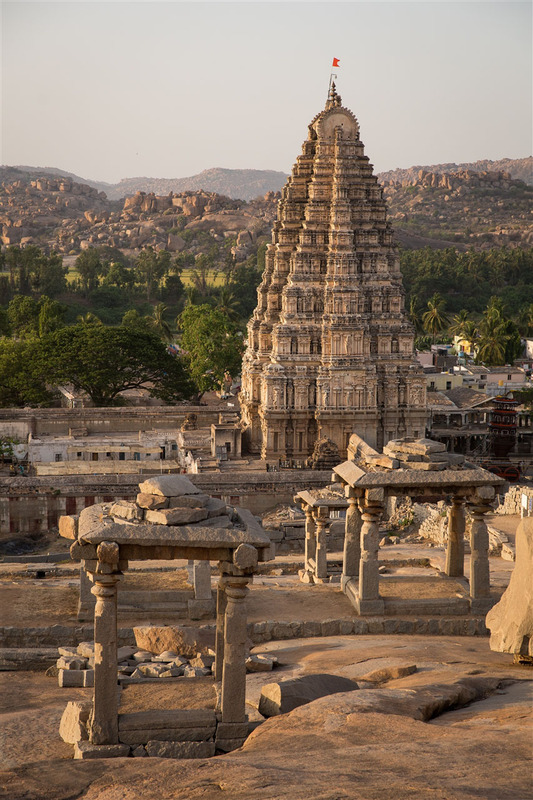 This is not one of the tallest hills in Hampi, but it’s a wonderful location to get splendid views of the sprawling ruins, in particular the twin gates of the Virupaksha Temple which with a bit of altitude under your belt are irresistibly photogenic. It took me about 15 minutes to climb to the top (not including endless stops for photographs! 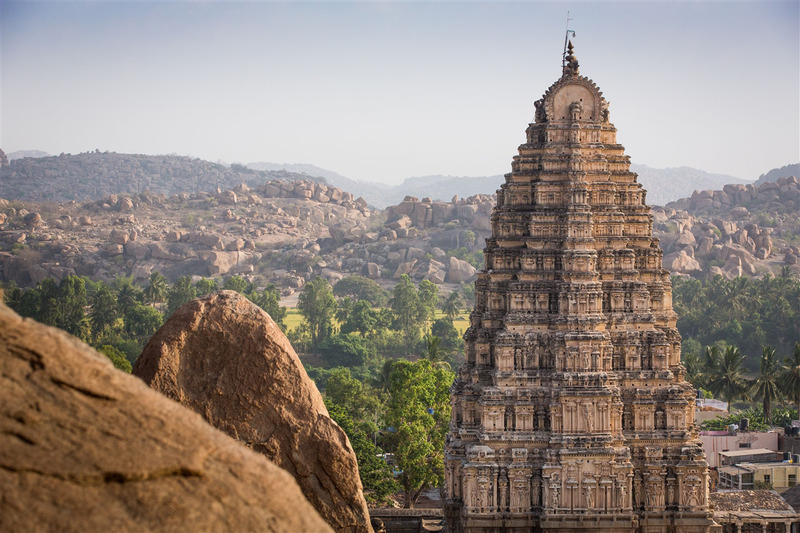 ), once there it’s an undulating expanse of relatively flat rock before the descent down towards the Hampi monuments of Krishna Temple and Narasimha Monolith. 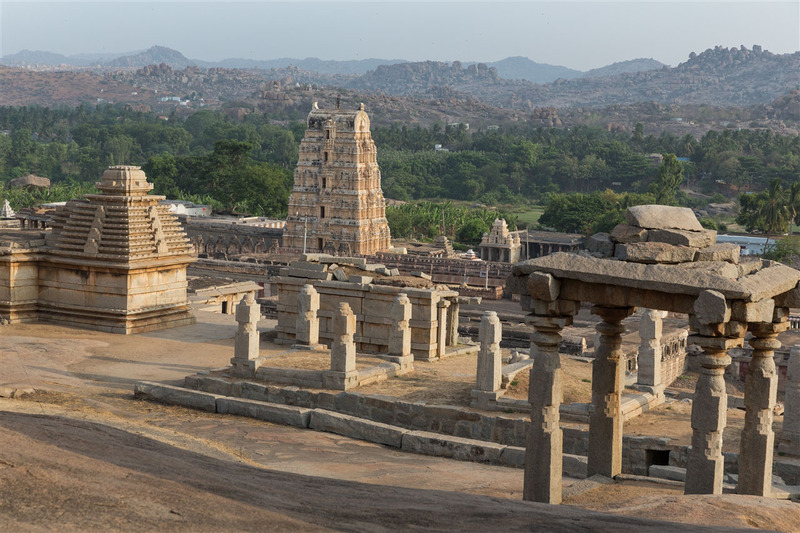 The hill itself is littered with smaller temples, gateways and pavilions with some fortifications around the perimeter that are believed to predate the Vijayanagar Empire. 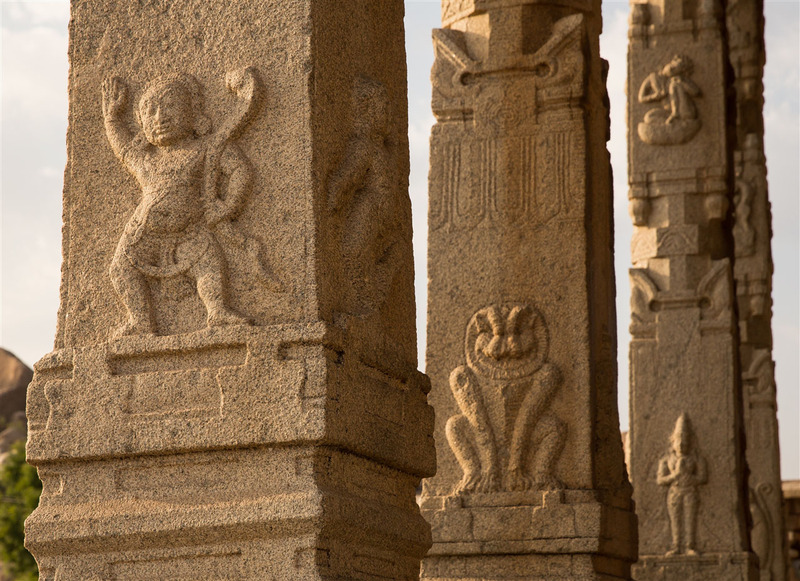 Many of the temple pillars are decorated with carvings, something which will become a bit of a theme for this Hampi series of travel photography blogs. I found myself getting a little addicted to them at times, desperately trying to do justice to them with my camera. 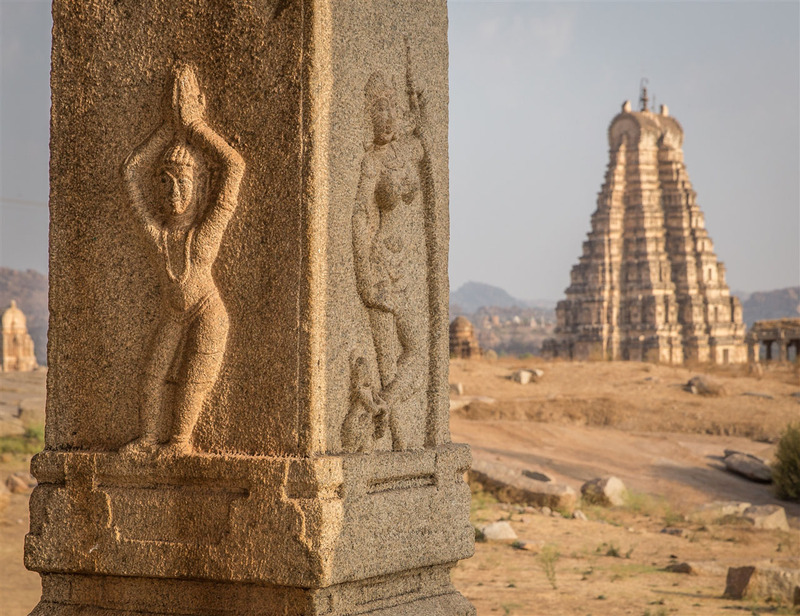 They are of course much later in date to the carvings found at places such as Pattadakal, and the workmanship could be considered somewhat crude in comparison. But they have a quality all of their own and you still have to be amazed at the effort involved in producing all this art. 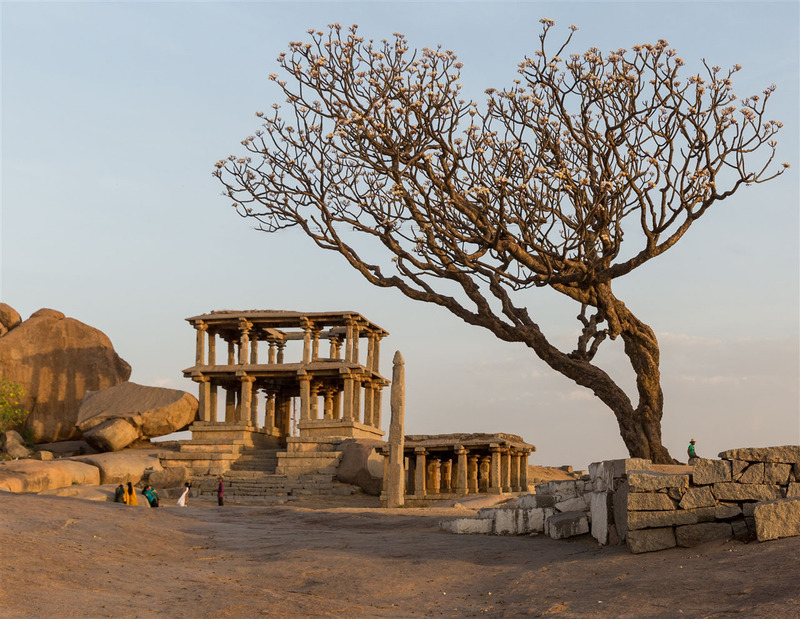 Little did I know that what exists on Hemakuta Hill is just scratching the surface of what the Hampi temples and monuments have to offer. 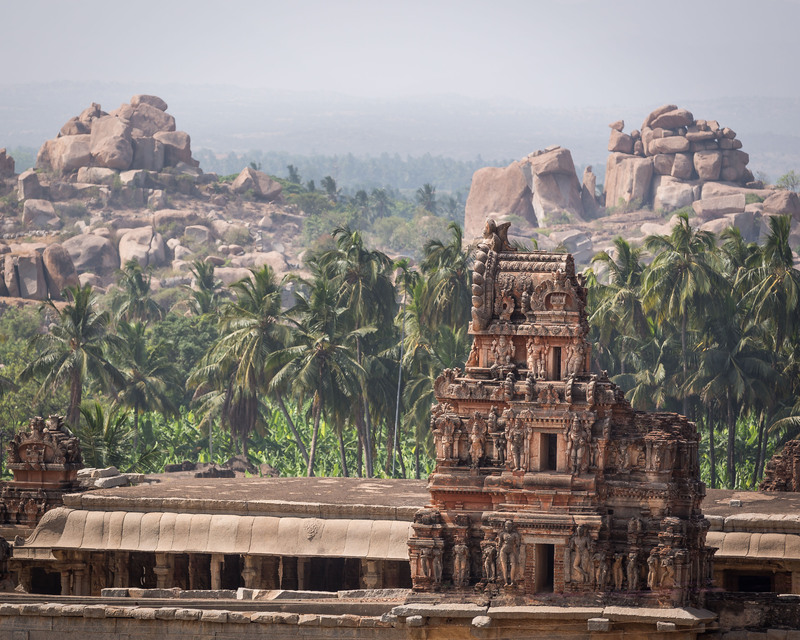 There are two larger temples on the slopes of the hill; the Sasivekalu and Kadalekalu Ganesha. Both are just beyond a double-storey gate that is one of two entrances to the hill. 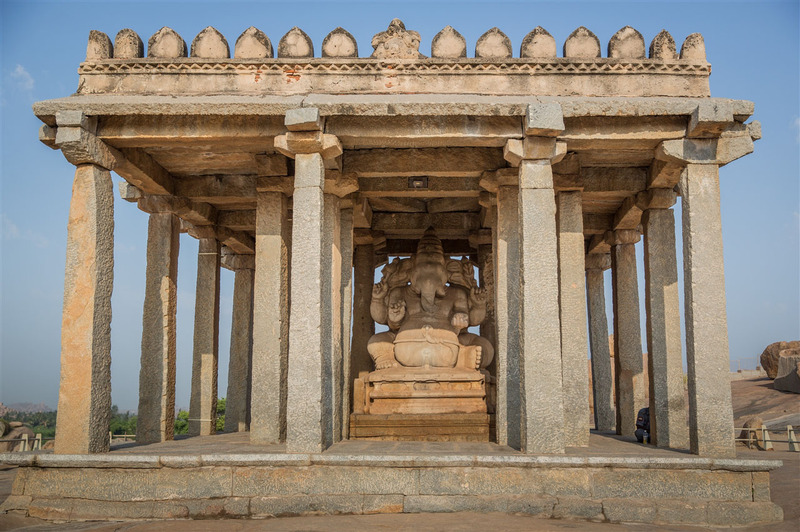 The 2.4m high Sasivekalu Ganesha, set in a pavilion, was carved out of a single boulder in-situ. 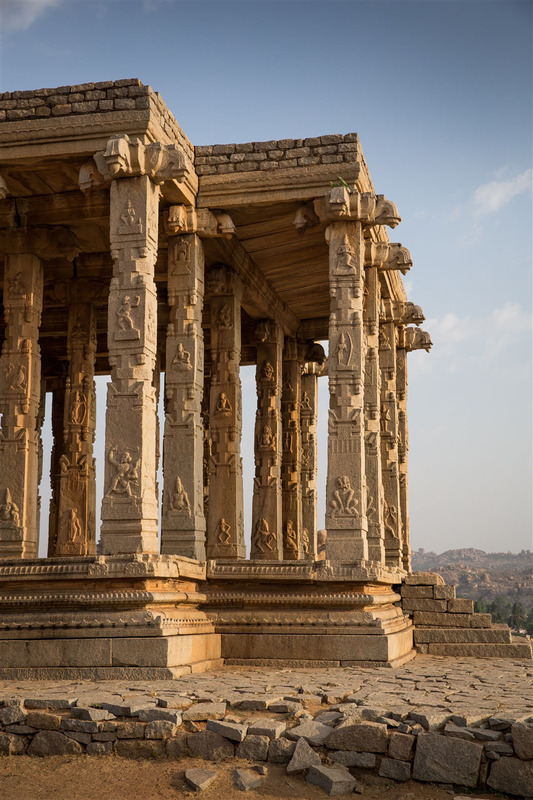 The narrow square pillars struck me as a little interesting, undecorated they gave the temple an almost Greek appearance. 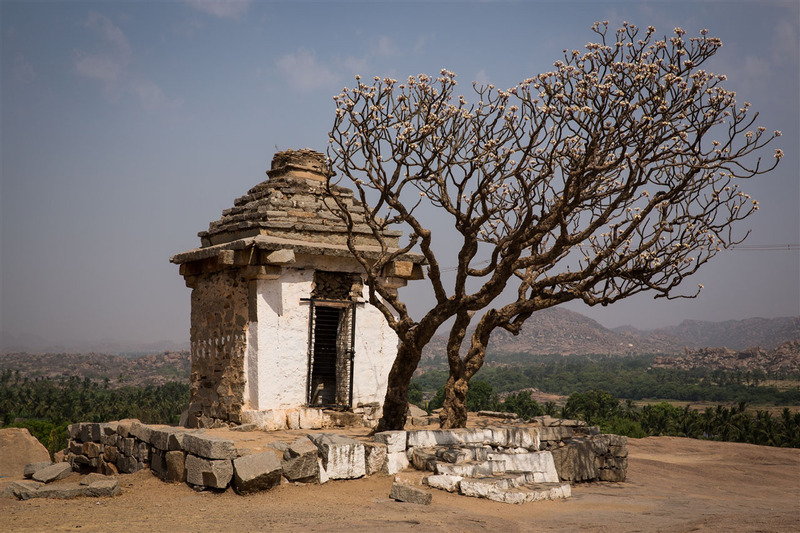 Legend has it that Shiva stayed on this hill while contemplating marriage to Pampa. When he finally decided to marry her, the sky miraculously rained gold on the hill, giving it the eponymous name Hema (gold in Sanskrit). There is still gold to be found on this hill, in the shape of golden light. 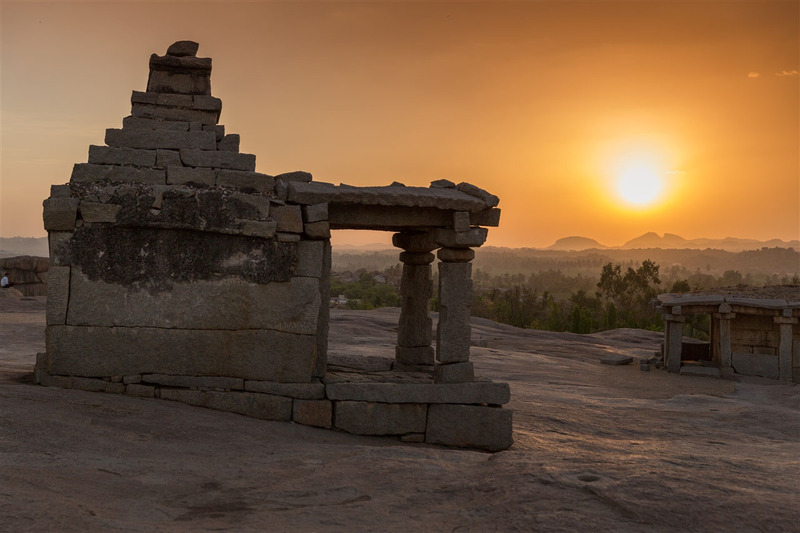 Hemakuta Hill is certainly one of the top locations in Hampi for watching sunset along with hoards of monkeys that seem to be there for the very same thing. 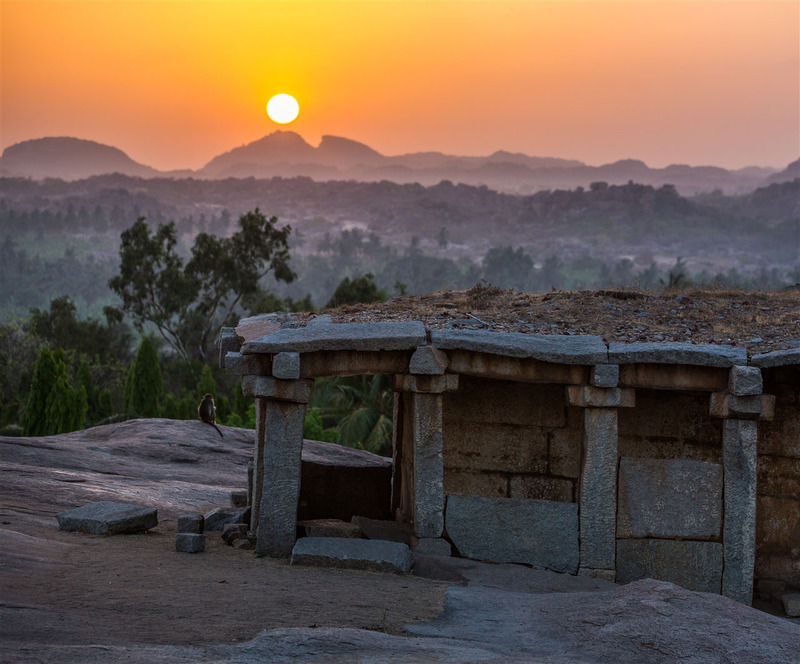 So I returned there at the end of my first day at Hampi, with the last rays of the day illuminating the ruins and wider landscape with a golden glow. 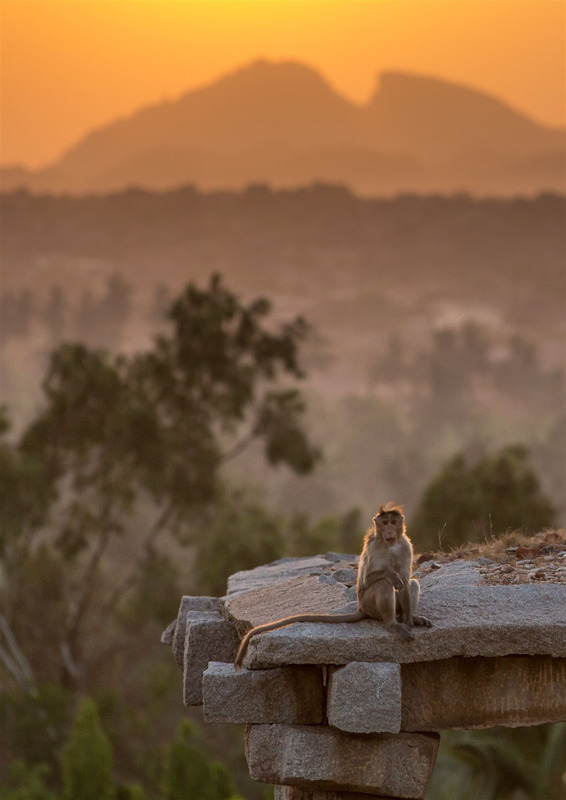 It’s a wonderfully peaceful way to end your day, but keep an eye out for your belongings as these monkeys are curious as to what the contents of your bag may have to offer ! 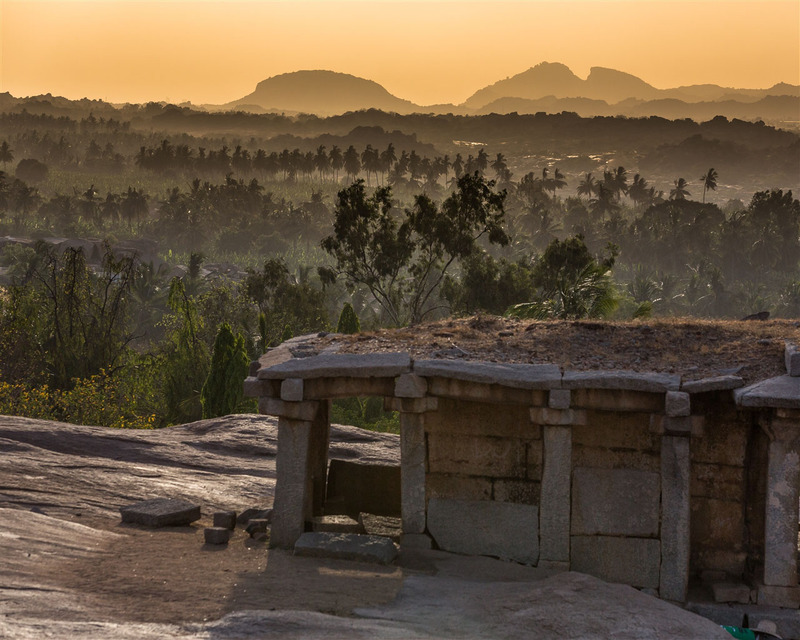 Beyond Hemakuta Hill lies many other Hampi monuments, and from the summit you can catch a glimpse of some of them rising up from the valley floor. 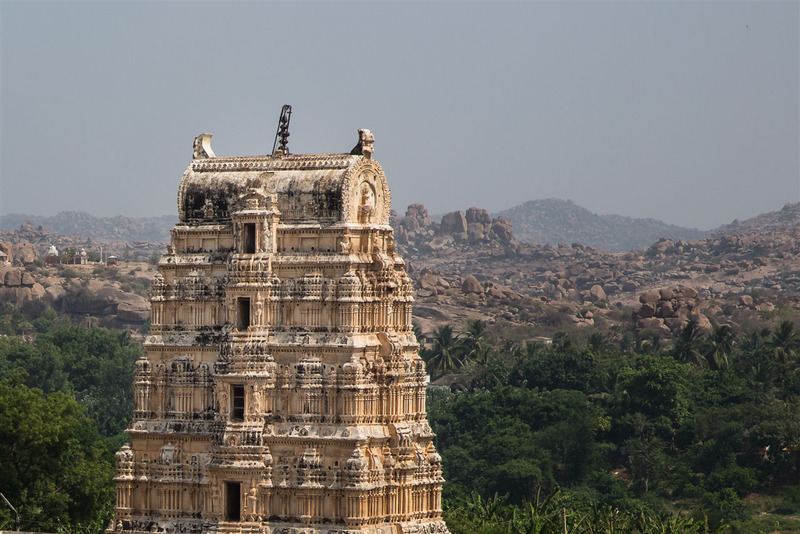 The most prominent of these being the nearby Krishna Temple, my visit there will be the topic of my next blog post. 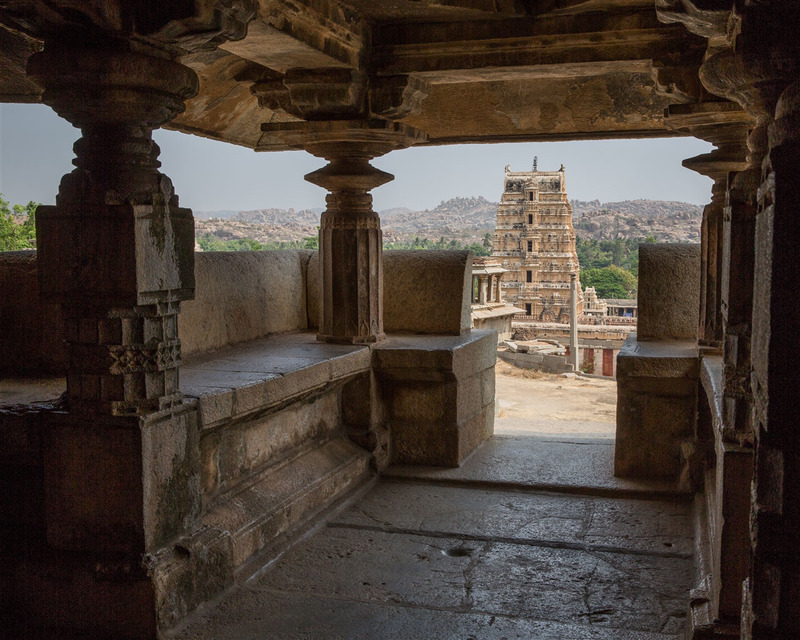 By the end of my first day at Hampi I was itching to explore further. There is something about this ruined city and its landscape that got under my skin. 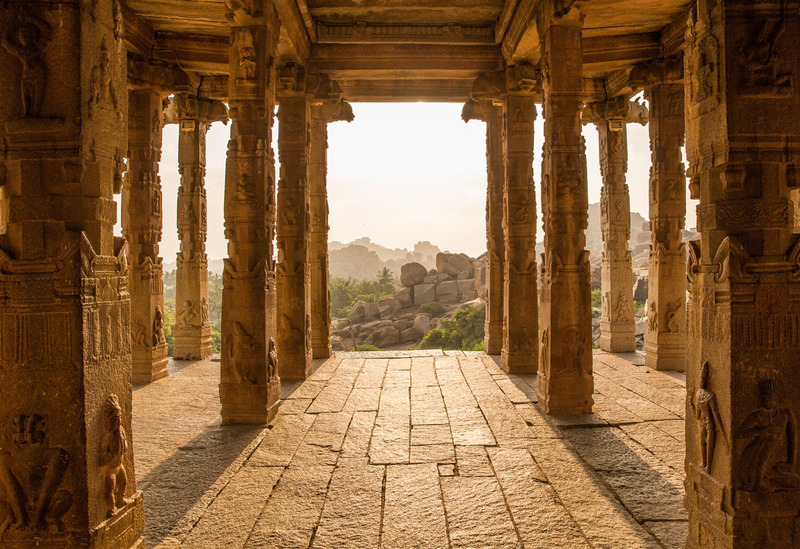 It seems to resonate with an intensity far greater than most other archaeological or historic sites I have ever visited anywhere in the world. I already knew that one visit lasting just three days was not going to do this place justice. 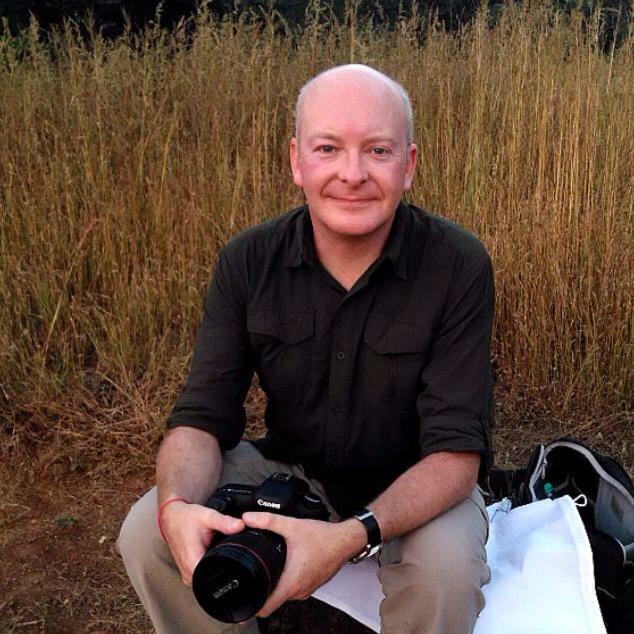 It certainly is, for me possibly the most magical of all of India (that I’ve been to). Thanks ! Just isn’t enough time to admire each pillar. 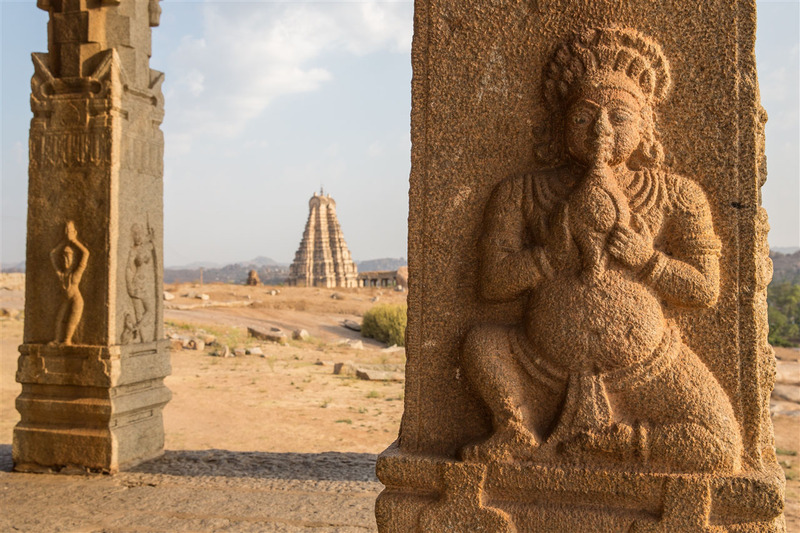 The carvings aren’t as fine as other temples like the Hoysalas’ but there’s just something about this place. 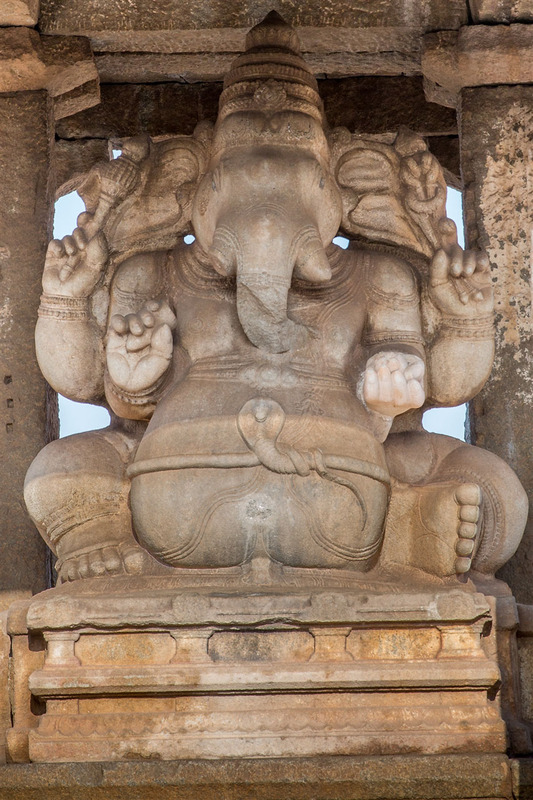 Hoysala carvings are more intricate because of the softer type of stone. 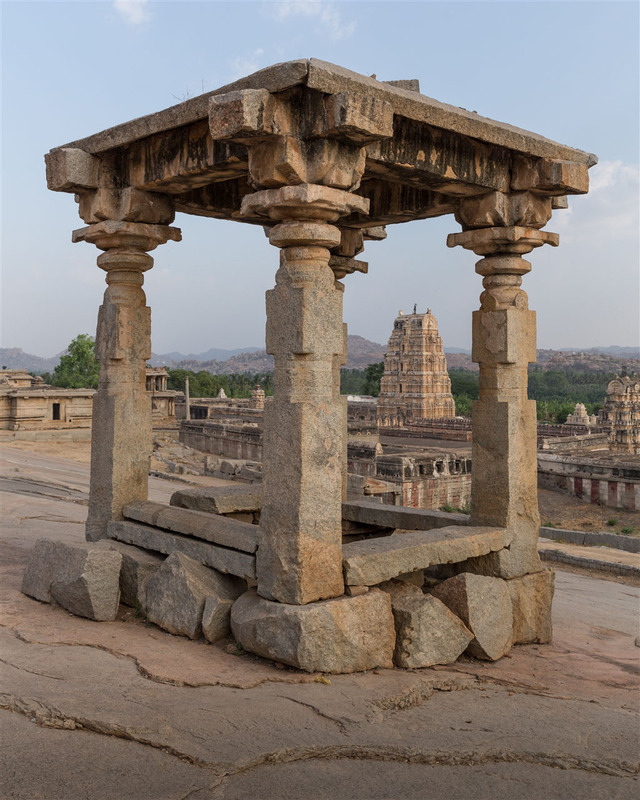 The granite found in Hampi area is a much harder stone and hence the carvings are not as intricate as the Hoysala sculptures or reliefs. That`s amazing! I love that kind of places where you can literally TOUCH the history…Wonderful!